Another late-season feeding frenzy photo, to go with Reid's. A couple of rufous hummers still linger here, south of his house. But they are less aggressive than earlier in the season (young of the year?). 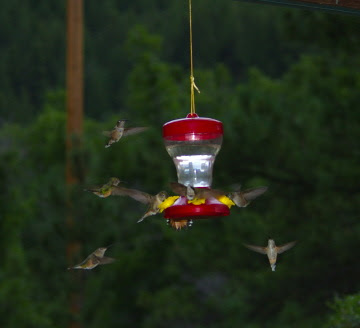 We have about a month left until the last hummingbird will have gone, and suddenly it will be very quiet. Michael Pollan Still Shops at Whole Foods. It's a Bear in the Backyard! More at 10!